Belarus remains the last country in Europe which keeps capital punishment. Activists of campaign “Possessed. Against the Death Penalty” produced a clip and explained why it should be changed. Apart from "green" events, Belarusian activists launched social campaigns including Belarus Days in Sweden with roundtable on media in Belarus. BelNetwork anti-AIDS issues annual report. Everyone who wants to learn Belarusian language has a chance to participate in the project “Mova ci kava”. Budzma became the partner of that initiative. From April 2013 Belarusian elderly in Minsk for the first time will have an opportunity to become the students of the Third Age University. KaliLaska opens. On 5 April, the first charity store KaliLaska will be opened in Minsk and aimed to help the homeless, children's homes, large families, shelters for animals. The shop takes second-hand things from population: about 20% of them are sold for money then; the bulk goes to vulnerable groups for free. Team of KaliLaska is an association of friends “who have decided to move from words to action: do something useful for the world”. Minsk Branding Team held public hearings. On 25 March, the public initiative Minsk Branding Team held open public hearings at live TV.TUT.BY. The meeting included presentations of research results of opinions of citizens on the Minsk brand (according to Group SATIO), the best submitted concepts, as well as an open discussion among professionals, the media and indifferent Minsk residents. Possessed. Against the Death Penalty. The campaign against the death penalty produced a video to the first anniversary of the execution of Uladzislau Kavaliou and Dzmitry Kanavalau, sentenced to death on charges of terrorism. The story tells why the Belarusian human rights activists oppose the death penalty, and what everyone should do to change the situation. BISS on tut.by’s Amplituda show. On 20 March BISS analysts Elena Artemenko and Andrei Eliseev were invited experts of a television TUT.by program Amplituda on the topic Migration of Belarusians. 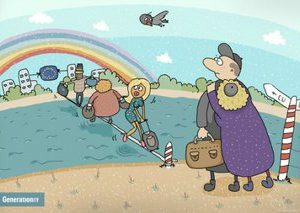 The experts told where, when and why Belarusians are leaving the country, as well as explained the migration impact on the demographic situation in Belarus. The material caused heated discussion of readers and collected more than 1,000 comments. Third Age University in Minsk. From April 2013, the first department of the Minsk City University of the Third Age is to be launched. Elderly people will be trained on computer skills under the faculty Information and Communication Technologies. The project aims to create conditions for further education of elderly and is implemented by Belarusian Association of Social Workers, supported by German Foundation Memory, Responsibility and Future. ICT study visit. E-Governance Academy (Tallinn) and Pact, Inc announce a call for participants for a study visit Public-Private Partnership for Development of E-governance. The visit is to take place on 28 April – 4 May 2013, in Tallinn and continues a series of events for the Belarusian participants to introducing to the experience of the Estonian ICT sector. Mova ci kava continues its regular lessons. Every Monday the Minsk residents have an opportunity to gather at the Gallery Ў to study Belarusian in an amusing and relaxed way. On 18 March more than 80 persons attended a lesson on the topic World through Belarusians’ View. The campaign Budzma is a partner of the initiative. REC recruits trainers. The Regional Environmental Center for Central and Eastern Europe (REC), with the support of Sida, announces a call for trainers/facilitators to assist the REC in organisational viability support work for the he project “Supporting Environmental Civil Society Organisations" (SECTOR). A group of ten trainers will be trained, and it is expected that four or five of them will be contracted under the project to provide support to CSOs to carry out self-assessments and draft organisational development plans. Economic and Business Education Abroad. On 7 April, Belarusian Economic Research and Outreach Center (BEROC) together with IPM Business School organise the conference Economic and Business Education Abroad, which will present opportunities for economic and business education in Europe and the U.S. The conference will present the programmes of leading educational institutions of Ukraine, Hungary, Poland and Lithuania. Earth Hour in Belarus. Earth Hour 2013 was held on 23 March at 8:30pm-9:30pm. Belarus joined the global campaign for the fifth time. The Green Alliance appealed to heads of the ministries and large industrial enterprises with a request to turn off the lights on billboards, and other communal property, where the blackout is not critical. Center for Environmental Solutions offers a series of related events for school pupils, including participation in the creation of the video "60 seconds for the Earth." International Day of Sparrow. On 30 March BirdLife Belarus invited to celebrate the Day of Sparrow in Baranovichi (Brest region). During the day, a series of events is to be conducted – putting up birds houses in the park, quiz "What bird am I? ", master-class on making birds out of unconventional materials, lotteries, sale of souvenirs and gifts from the test with the image of birds. Capacity development for environmental CSOs. The Regional Environmental Center for Central and Eastern Europe (REC) announces a call for environmental CSOs which are interested to get support in their capacity development. The organizers are to provide ongoing support of a facilitator during all the process. CSOs that will design a long-term development plan successfully are eligible to receive a grant of up to 8,000 euro to improve their capacity. Update From Belarus. On 12 April, Carnegie Endowment for International Peace (Washington, DC) hosts a discussion of the current situation in Belarus with a delegation of professional and CSO Belarusian leaders. Speakers will include Yury Chavusau, the Assembly of Pro-Democractic NGOs, Janna Grinyuk, the Center of System Business Technologies, and Yury Zisser, creator and founder of TUT.BY. Travel for this delegation is supported by USAID and Pact. Belarus Days in Sweden. On 19-21 March “Belarus Days” were celebrated in Sweden. The agenda included a round-table discussion Media under pressure with the participation of Zhanna Litvina, BAJ, Yuliya Slutskaya, Solidarity with Belarus Information Office, etc. Also several other events were held with the participation of the Belarusian and Swedish human rights defenders, representatives of Amnesty International, Belarusian musician Liavon Volski. Belarus in Focus: International journalists awarded in Warsaw. Winners of the international journalism competition ‘Belarus in Focus 2012’ were awarded on 15 March in Warsaw. The competition received 60 articles from 36 journalists from 16 countries all over the world. The most articles were sent by journalists from Belarus, the United Kingdom, and Poland. The Belarusian media more and more look like barricade journalism. The state media fiercely fight their non-state colleagues and vice versa. Endless clichés, mutual accusations and the language of hatred often leave little space for decent journalism.